Our Disney friends do a lot of wishing and dreaming. Peter Pan wished he never had to grow up. Aladdin’s was trying to decide which three wishes Genie should grant. Wishes are funny things. We wish on stars, on ladybugs, on birthday candles, on shooting stars. As we grow up, some of us start to believe less, or not at all, in wishes. Personally, I think some people just won’t admit that they still make wishes! Think about how many times you hear someone begin a sentence with “I wish…” Maybe they aren’t being literal, but I think there is still that little part of all of us that wants to believe. For me, wishing is hopeful. You can call it childish naivete, but I’m fine with that. Wishes carry the faith that things will be okay. There have been times- especially when I was watching Ben and my dad struggle with their illnesses and I was also struggling as a caregiver- when I just needed to believe that my wishes and dreams could come true, despite what logic might have told me. 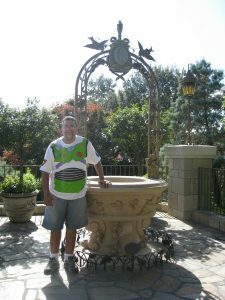 Ben and I never made a point of going to the Wishing Well at Cinderella’s Castle during our many visits to Walt Disney World. And then he was diagnosed with ALS. With a diagnosis like that, you’ll find yourself believing in a lot of things! 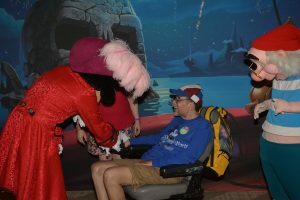 Ben was diagnosed in April 2010 and in May we headed to Walt Disney World, not knowing how the disease would progress. 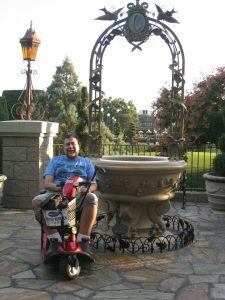 We headed right to that Wishing Well, and we returned each time we went there after his diagnosis. I emptied a purse of coins into that Well each time, wishing that his ALS would go away, that we could turn back time, that there would be a cure. Did it change anything? Did his ALS go away? No. The disease took away his abilities one by one- physical devastation for him and an emotional toll on both of us. And, our happily ever after was cut very short. So, how I can say that I still believe in wishes? Because my heart needs to. When we went to Walt Disney World for the last time, in July, 2014, we went on the Pirates and Pals Fireworks cruise, where we met Captain Hook and Mr. Smee and then took a boat ride with a very funny pirate to watch the “Wishes” fireworks show from the water. Ben loved watching the fireworks at Walt Disney World, and the display really was pretty spectacular from the lagoon. 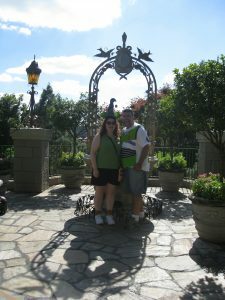 When the “Wishes” song played, as we listened to the words, we both cried. For a lot of reasons. In our hearts, we both knew it would likely be our last trip to Walt Disney World. 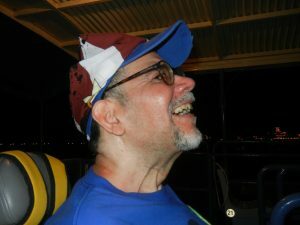 The progression of ALS varies from patient to patient, so although we knew the eventual outcome, we did not know where the journey would lead from day to day. We just wanted to be able to wish on those stars and have our dreams come true. It’s that conflict between being realistic and being hopeful. Have the wish, I wish tonight. So make a wish, see it through. Dare to do what dreamers do. We put our faith and hope on a shooting star. You know, any wish is possible. All it takes is a little courage to set it free! A wish is a powerful thing—especially when it comes from the heart. Remember, we must always believe in our wishes, for they are the magic in the world. Now, let’s all put our hearts together and make a wish come true. Ben loving the Pirates & Pals Fireworks Cruise. I think one of the hardest things in life is feeling that there is no point in having faith in wishes and dreams. As Mrs. Potts told Chip in Beauty and the Beast, “You don’t lose hope, love. If you lose hope, you lose everything.” So, I keep wishing and believing that my dreams can come true. Without that mindset, I don’t think I could have gotten through caregiving and watching Ben and my dad struggle. I don’t think I’d be able to envision working through grief. 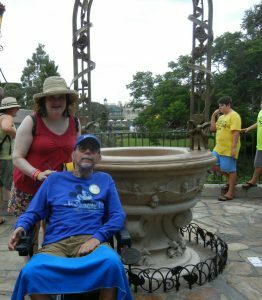 We wished for a cure for ALS as we tossed our coins into the Wishing Well, but that wish did not come true, at least not in time to help Ben. Of course, as Cinderella’s Fairy Godmother said, “Even miracles take a little time.” I will wish for that cure until it happens. For me, as I’ve written before, the pixie dust may be in the perspective. Ben and I did have some wishes come true. For four years, Ben managed pretty well with the disease. He did not want to lose his ability to walk, but he made using the scooter and then the electric wheelchair so much fun. With Ben zipping around, we laughed our way through the Disney Parks. Although traveling to Walt Disney World became more and more complicated, he handled it with a great attitude and with determination to have a wonderful time, and he did. We always said we wished we could go there more often, and after Ben’s diagnosis, we were able to go there four more times, which was quite a treat and a splurge for us. We relived beautiful memories, created new ones and had a lot of laughs, along with some tears. And, we had a lot of love that got us through very difficult times. So, maybe there was some magic in that Wishing Well. And maybe the true magic was the gift of seeing love, laughter and light in a very dark situation. Princess Aurora says, “If you dream a thing more than once, it’s sure to come true.” So, I will keep wishing and dreaming and feeling the pixie dust. I hope you do, too, and I hope your wishes and dreams come true. Your story was awesome, giving my courage to Live on with this horrific disease ALS . I was diagnosed in 2012 with ALS.